« Why on earth do we put up with this green extortion? Här kommer en mycket intressant undersökning gjord av de klimatmodeller som IPCC använder. Och som Global Warming Hysterikerna avgudar och dyrkar och på vars altare man är beredd att offra vårt välstånd och ekonomiska tillväxt de närmaste 100 åren eller så. Vad man har gjort är at jämfört kilmatmodellernas förutsägelser med verkliga data från minst 100 år från olika platser på jorden. ”• The huge negative values of coefficients of efficiency at those scales show that model predictions are much poorer that an elementary prediction based on the time average. As falsifiability is an essential element of science (Karl Popper), many have disputed the scientific basis of climatic predictions on the grounds that they are not falsifiable or verifiable at present. This critique arises from the argument that we need to wait several decades before we may know how reliable the predictions will be. However, elements of falsifiability already exist, given that many of the climatic model outputs contain time series for past periods. 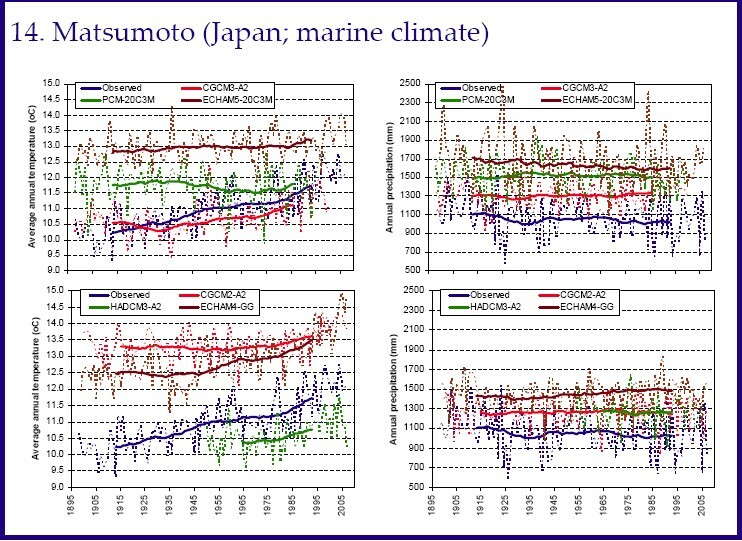 In particular, the models of the IPCC Third Assessment Report have projected future climate starting from 1990; thus, there is an 18-year period for which comparison of model outputs and reality is possible. 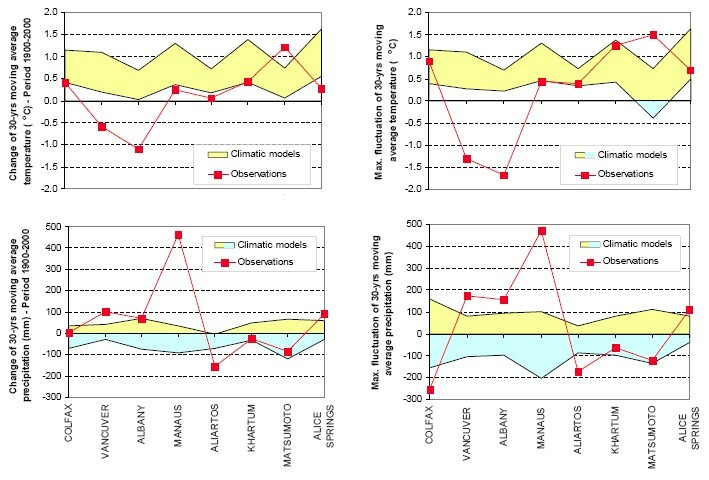 In practice, the climatic model outputs are downscaled to finer spatial scales, and conclusions are drawn for the evolution of regional climates and hydrological regimes; thus, it is essential to make such comparisons on regional scales and point basis rather than on global or hemispheric scales. In this study, we have retrieved temperature and precipitation records, at least 100-year long, from a number of stations worldwide. We have also retrieved a number of climatic model outputs, extracted the time series for the grid points closest to each examined station, and produced a time series for the station location based on best linear estimation. 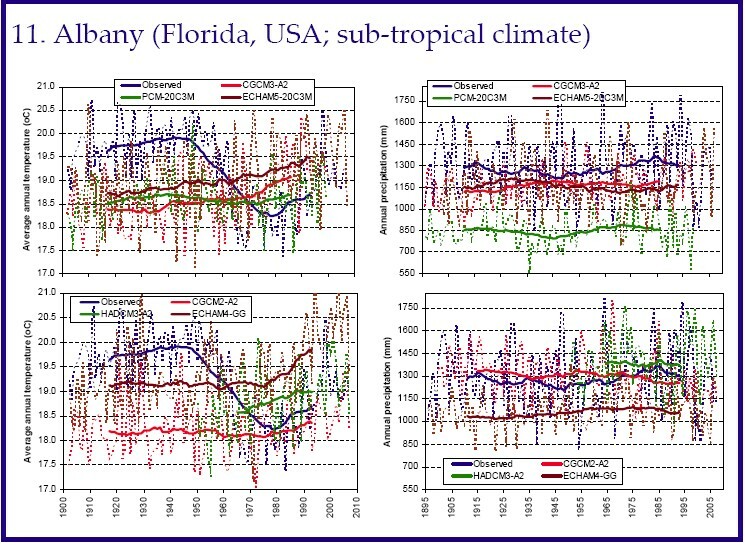 Finally, to assess the reliability of model predictions, we have compared the historical with the model time series using several statistical indicators including long-term variability, from monthly to over year (climatic) time scales. Based on these analyses, we discuss the usefulness of climatic model future projections (with emphasis on precipitation) from a hydrological perspective, in relationship to a long-term uncertainty framework. 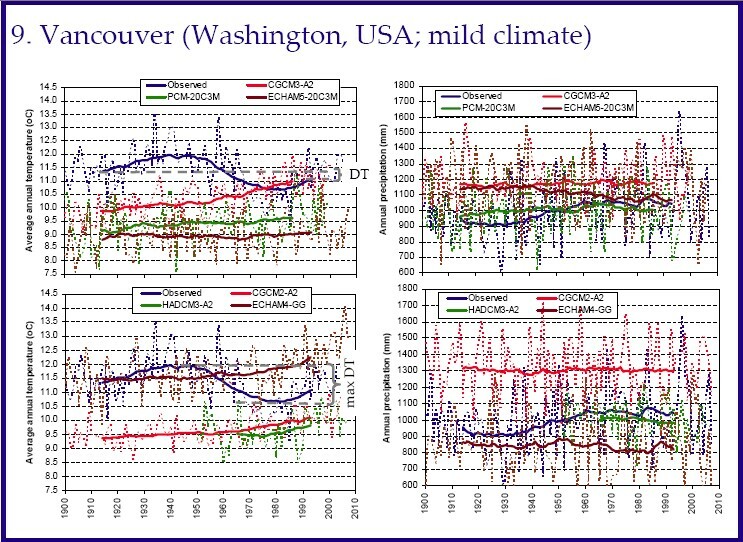 – All examined long records demonstrate large over year variability (long term fluctuations) with no systematic signatures across the different locations/climates. – GCMs generally reproduce the broad climatic behaviours at different geographical locations and the sequence of wet/dry or warm/cold periods on a mean monthly scale. 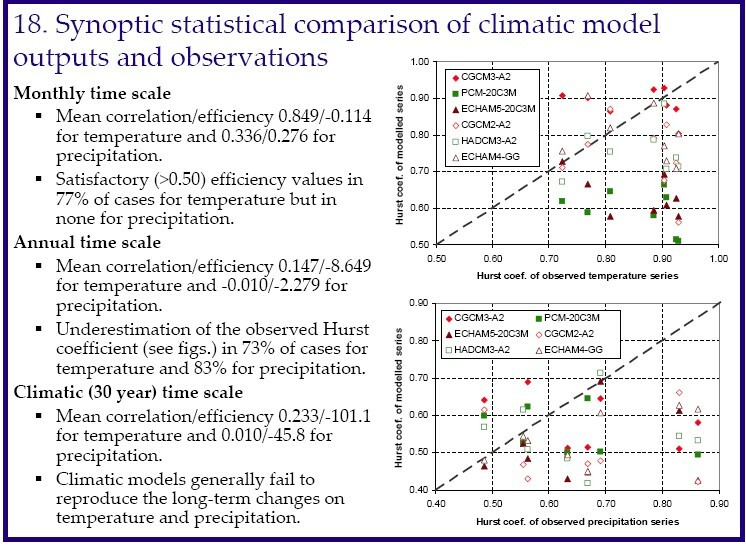 – However, model outputs at annual and climatic (30 year) scales are irrelevant with reality; also, they do not reproduce the natural over year fluctuation and, generally, underestimate the variance and the Hurst coefficient of the observed series; none of the models proves to be systematically better than the others. 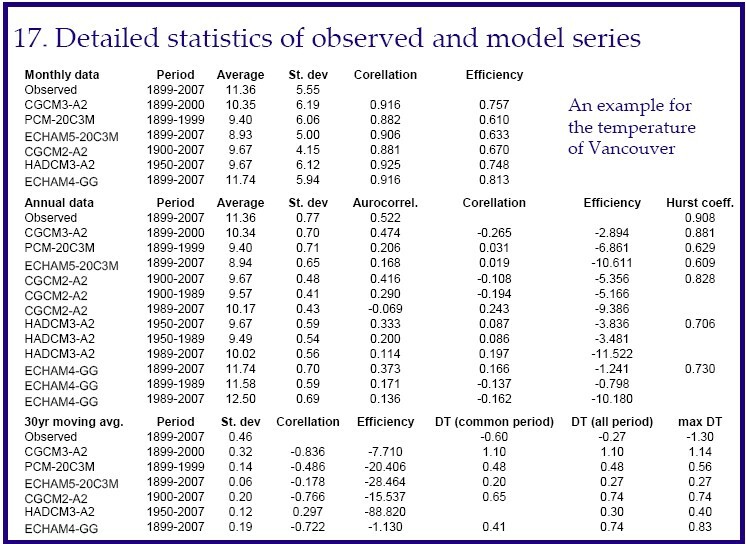 – The huge negative values of coefficients of efficiency at those scales show that model predictions are much poorer that an elementary prediction based on the time average. – This makes future climate projections not credible. – The GCM outputs of AR4, as compared to those of TAR, are a regression in terms of the elements of falsifiability they provide, because most of the AR4 scenarios refer only to the future, whereas TAR scenarios also included historical periods. This entry was posted on 11 maj, 2008 at 12:56 f m and is filed under Miljö - Environment. You can follow any responses to this entry through the RSS 2.0 feed. You can leave a response, or trackback from your own site.